Summertime is here and the Fourth of July is less than a week away. Block parties, summer cook-outs and other outdoor fun is on tap for the upcoming holiday. However, more fires are reported on July 4th than any other day of the year in the United States. Nearly half of those fires are caused by fireworks. According to the U.S. Consumer Product Safety Commission, every year around 10,500 Americans are injured by fireworks. The majority of the injuries (67%) occur between June 22 and July 22. Most of the injuries involve the hands and fingers (31%), 14% involve the eyes, another 22% involve the head/face/ears, and almost 54% of the wounds are burns. Many people believe that items like sparklers and bottle rockets are safe, but in reality these, along with other Class C fireworks, Roman candles, and fountains, can account for two-thirds of fireworks injuries. These are illegal in many states. Illegal fireworks account for about 29% of fireworks injuries. Currently, the state of Illinois only allows sparklers and other novelties fireworks. •	Don’t assume you know how to use the fireworks. Read the directions and warning labels. If they do not have any, do not use them. •	Consider your pets when planning to shoot off fireworks. If you have a pet that may chase a fast moving target, or a pet that will be frightened, put them in the house to keep safe until the display is over. •	Don’t carry fireworks in your pocket. •	Don’t drink alcohol and light fireworks. •	Don’t let children light fireworks unless under supervision. Boys between the ages of 10-14 are injured more than any other age and gender group. In general, 40% of people injured by fireworks are under the age of 14. •	Don’t light fireworks indoors. •	Don’t light fireworks on or near dry grass. •	Never ignite fireworks in a container, especially a glass or metal container. •	Don’t’ throw fireworks at people. •	Don’t wear clothes that are loose fitting. •	Fireworks should be kept in a cool, dry place. •	Sparklers are not a safe for children to play with. They can burn up to 1,800 degrees Fahrenheit. (That is hotter than what it takes to melt glass and aluminum.) If used, children must be under adult supervision. •	Keep a bucket of water or fire extinguisher handy. •	Only light one firework at a time and move several feet away from it after it is lit. •	Be sure other people are out of range before lighting fireworks. •	Only use legal fireworks. 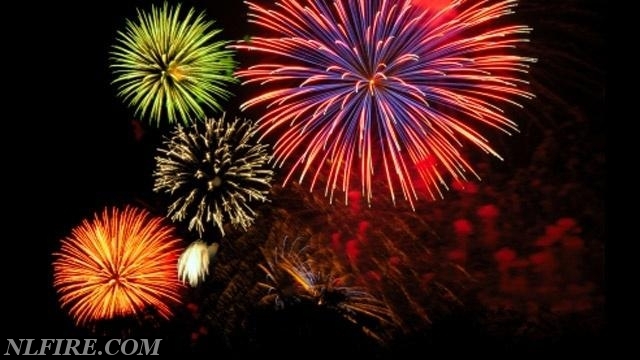 •	Purchase fireworks from a reliable dealer. •	Wear safety goggles when lighting fireworks. •	Never have any portion of your body directly over a firework while lighting. •	Do not try to relight a firework if it does not go off. Douse it with water and dispose of it. •	After the firework display, never allow children to pick up fireworks that may be left over, they may still be active.